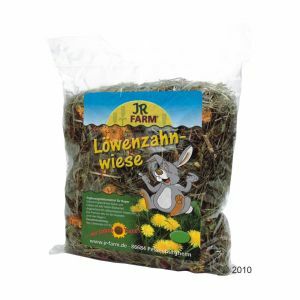 JR Farm Special Hay is a gently dried rabbit hay mixed with tasty ingredients. With a range of flavours including carrot, apple and dandelion. 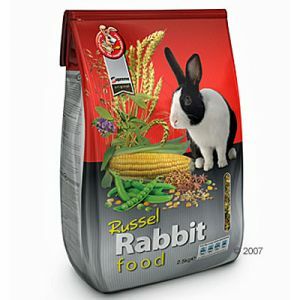 Premium complete food for adult rabbits. Excellent supplement to the daily ration of hay. Rabbits enjoy a love a good meal. A mix of hay, pellets, fresh vegetables. a constant supply of fresh water and the occasional treat, will all help to keep your rabbit healthy and happy. These should be purchased so that they are fresh. Look for pellets that are relatively high on fibre and low in protein. Pellets that are high in protein can lead to obesity and other health issues in rabbits. When choosing hay try to make sure that it looks and smells fresh. Do not give your rabbit hay that looks mouldy or brown or doesn't smell like fresh grass. Store the hay in a dry place with a good airflow to keep it from going mouldy. 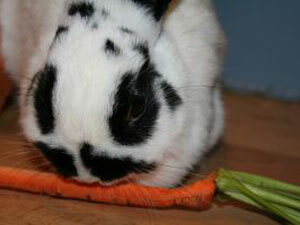 A variety of vegetables should be a part of your rabbit's normal daily diet. Always try to choose vegetables look fresh and are free of pesticides. Before giving them to your rabbit always wash your vegetables thoroughly. When letting your rabbit try new vegetable do so in small quantities in the beginning, until you can see that your rabbit reacts well to them. Do not feed rabbits the leaves from houseplants, as many are poisonous to rabbits. Always have fresh water available for your rabbit. 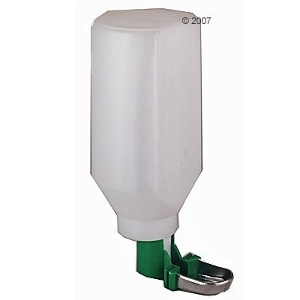 A hanging Rabbit Water Bottle is a great option for a rabbit cage. Many rabbits will also drink from a water dish or bowl, but will often tip them over. On a hot day you can drop an ice cube or two in your rabbits water dish. If your rabbit does not seem to be drinking enough water you can leave the vegetables fairly wet when you put them in the cage. To ensure your rabbits health, treats should be given only occasionally. Do not feed your rabbit items high in carbohydrates like breads, crackers, pasta, pretzels, cookies, chips, or cereal. Although branded for rabbits, many commercially sold pet rabbit treats are high in fat and sugar, such as yoghurt chips, and should not be given. Never give chocolate, as it is toxic to rabbits. Fruit is the best option for a treat, but again you should give it only in small amounts because of the sugar content. Like vegetables, be sure that they are thoroughly washed. Practical water bottle to provide daily fresh water for your rabbit.